There are two main groups of orcas seen in the waters off Vancouver Island, namely the Northern and Southern Resident Killer Whales. Another species are the transient killer whales who are not considered a part of the resident pods and are less social. It is not uncommon for resident killer whales to interact with tour boats or check out their passengers by spyhopping beside them. At times they have been seen surfing in the wake of the vessels which ply the northern waters off Vancouver Island. 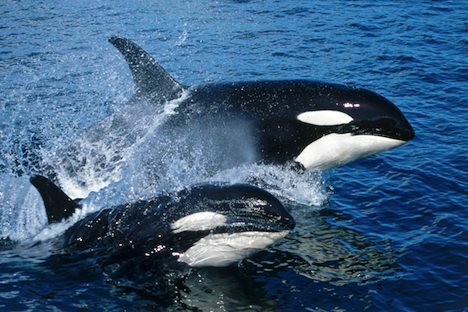 Two surfing Killer Whales, Orcinus orca, in the waters off Northern Vancouver Island, British Columbia, Canada. Picture of two northern resident killer whales, a female and baby surfing in the waters off Vancouver Island.